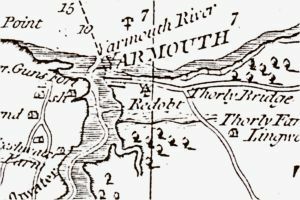 The town of Yarmouth developed as a port in the 12th and 13th centuries as the previous harbour of Thorley haven continued to silt up and become too shallow for the merchant ships of the time. 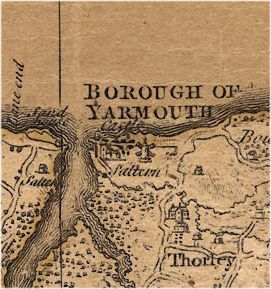 Yarmouth had thus emerged as a more convenient landing place for serving the Thorley area and its hinterland. 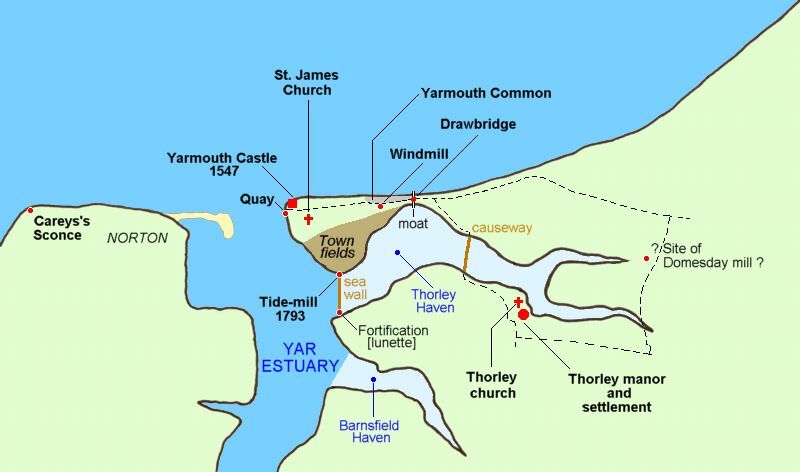 It also had a defensive advantage in that it was almost surrounded by a natural 'moat' in that it was bounded on the north by the sea; on the west by the Yar estuary; and on the east and south by Thorley haven, which extended as far as the village of Thorley. Only a narrow neck of land connected the Yarmouth peninsula with the Island mainland at its eastern end. By the 16th century, Yarmouth's status and importance had declined considerably and this continued into the 17th century with the rise of the port of Cowes. However, it was still of enough strategic importance for Henry VIII to build a castle here in 1547. 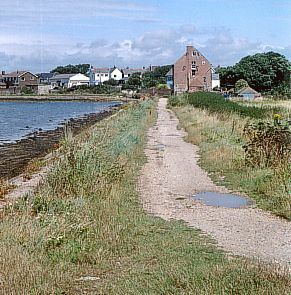 Thorley Haven and original road to landing place at Yarmouth. Almost a hundred years later, additional defence was required to secure the town. 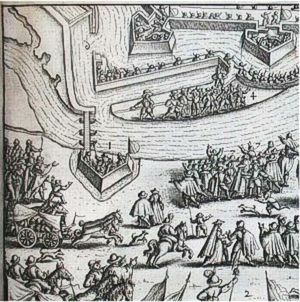 In 1629, fearing invasion from the French, a small group of Island gentry, including Sir John Oglander, "concluded to goe to London, to petition his Matie for moneyes to have owre castells and fortes some amended, others where most nede requyred, newe erected; and also for to have 2 places of retryte, if so wee showld be beaten; Videlicet - Freschwater for owre cattel, and ye mayne bodie of owre companies; and Yarmouth for ye bettor sorte of people, where they myght by bote have intercorse one with ye other; the fortifiinge of which places of retrayt myght be doone by cuttinge of Freschwater Gate; and Yarmouth by ye cuttinge of ye nicke of land betweene ye 2 seaes, with drawe brydges and half moones to secure ye passages." Oglander had estimated it would cost "for ye fortifiinge of Yarmouth to make it a place of retrayte with cuttinge ye seae, makinge a drawebridge and halfe moone, 250£ ; the lyke for Freschwater, 250 £ ..." Later in 1638, the Mayor and Burgesses issued a petition against this plan, claiming that it would ruin their harbour by reducing the current of the river, the force of which was only just sufficient to keep the harbour clear [SP 16/408 f. 69, 70]. It is still mentioned in 1789 in a lease of Thorley manor house and farm, and Bouldner, when the text refers to a "... piece or Parcel of Marsh or Moorey Ground near the Draw bridge containing by Estimation Six Acres ..." [Counterpart lease, 9 Jan. 1789. JER/HBY/78/2]. To defend the sea side of the town, a row of wooden stakes or piles were driven into the foreshore running parallel to the coast between the drawbridge and Yarmouth castle [see picture below]. These were to prevent the landing of troops from small craft, a similar feature using steel scaffolding poles being seen on British beaches again three hundred years later in 1940, when a German invasion seemed imminent. 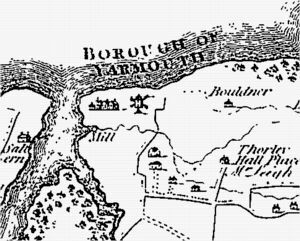 The sea formerly nearly surrounded Yarmouth until the year of 1664, when Sir Robert Holmes being Governor of the Isle of Wight, formed and embanked the marches. It was then garrisoned by a company under his own immediate command; and considered at the time to be strongly fortified. A redoubt for small arms was thrown up near Thorley wood adjoining to the present mill; canon were placed at a landing near the castle. Three pieces of canon were placed on the common facing sea, now called the Bulwarks; breastworks were thrown up at the shore; and large stakes, drove in to prevent the landing of boats, nearly surrounded the place; the stakes are still easily discovered at low spring tides. At this time, the very narrow neck of land at the eastern entrance was secured by a drawbridge. It is possible that it was at this time that one, or maybe two redoubts, were constructed to defend the two entry points into the town: the eastern end via the draw bridge and the southern end via the embankment. A small fortification, a type known as a lunette, was built at the southern end of the causeway, straddling the Thorley Brook where it flowed past the southern side of the Thorley Haven. This fortification was built to deny an enemy access into Yarmouth via the causeway. 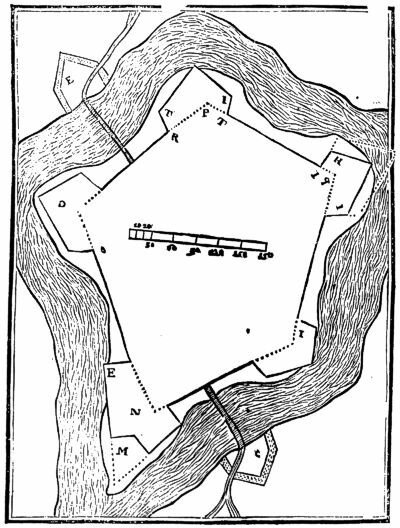 An Admiralty map of 1794 by George Burns shows a "redobt" situated at either the southern or the eastern end of the town, covering the drawbridge. It is uncertain when these were built but it would seem likely that they were constructed as part of the reorganisation of Yarmouth's defences in 1662-1664. The causeway lunette is shown on a plan of around 1720 of the western end of the Isle of Wight [King George III Topographical Collection: Shelfmark K top Vol 15, 4]. 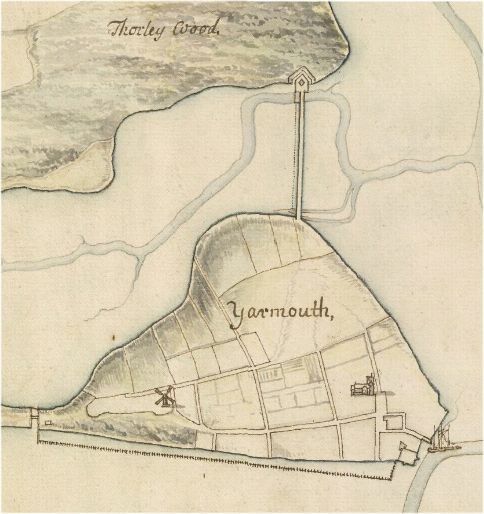 [Left] Map of Yarmouth drawn c. 1720, showing the lunette fortification, the quay, Yarmouth Castle, and Yarmouth windmill. The line of anti-invasion piling can be seen running along the foreshore from the drawbridge to the castle. The Thorley Brook flows past the southern end of the haven unlike today when it flows past the north end. South is at the top of the picture. 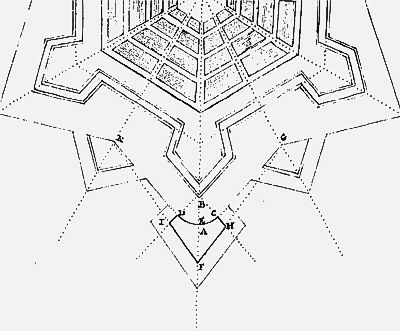 [Above] Detail of the lunette taken from the 1720 plan. It is also mentioned in two leases. A lease, dated 9 July 1730 to Edward Adams of Yarmouth, joiner, with permission to erect a salthouse and salt pans, mentions the location of 4 1/2 acres of marsh ground as being "near the Redoubt" and in the Manor of Thorley [JER/HBY/76/4]. Another lease of the same plot, dated 8 July 1788, mentions it as being "near the Redoubt at Yarmouth" [JER/HBY/76/5]. 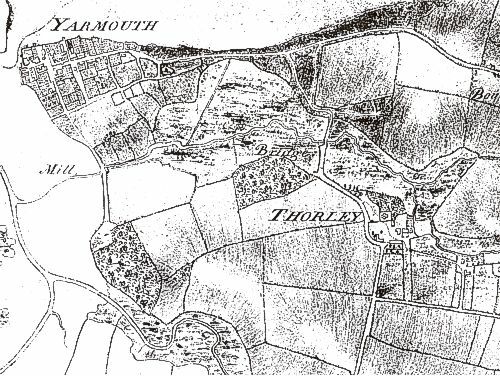 A 1792 map and subsequent maps all show the Thorley Brook as entering the marshes on the north side of the Thorley Haven. 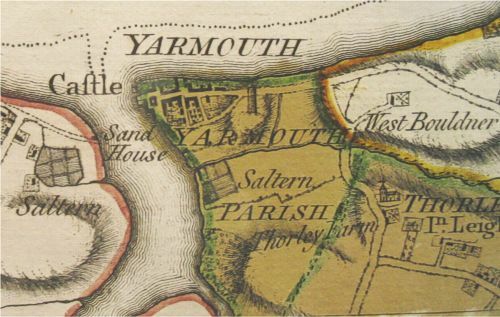 Possibly the fort was dismantled when the tide mill was built and the entry of the brook into the River Yar was diverted from the south side to the north. 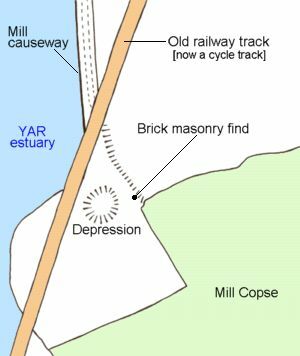 Today the site has been cut through by the old Freshwater to Newport railway track embankment that crossed the Thorley marshes obliquely from Yarmouth railway station to the southern end of the mill embankment. On the south side of the junction of the mill dam and the railway embankment, there is a large depression feature, which is filled mainly with rushes and is wet and boggy in winter. This seems to correspond with the ditch of the lunette. This depression is shown on 19th century maps as a pond. At the side of the footpath through to Mill Copse, some mortared brickwork and stone was unearthed, revealing early 18th century bricks. There was also a considerable spread of mortar in the soil at this point too. A sample brick measured almost 8" in length, 4" in width and 1 7/8" - 2" in breadth. This is consistent with 17th and 18th century brick dimensions. It is a place brick, showing the rough indentations of a brick made and dried straight on the ground. It is a terracotta colour, veering on a light orange in places. Small stone inclusions occur. The bricks are very similar to those of Shandon in the High Street, Yarmouth, an early 18th century brick-built house. The "seawall" or mill embankment, looking north from the southern end. Yarmouth mill can be seen at the end. 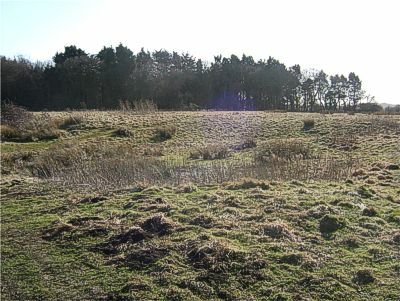 View of redoubt site from the southern end of the mill embankment, looking southwards and showing large depression in the centre. Refer to 19th century maps of this area. It would seem that at one time the present road to Thorley across the marshes was only accessible at low tides and thus a journey to Thorley required quite a detour via Hill Place Road. Various early maps show this short route marked but it only became a permanent embanked road available at all states of the tide at a later date, possibly once the 'sea wall' across the mouth of Thorley Haven had been built in 1664. A survey into church livings made about 1654 provides an early clue to the condition of this shorter route to Thorley. The returne for the parishe of Yarmouth in the Isle of Wight concerning the survey to be made for preachinge ministers and mayntenance for them etc. ... Wee have noe preaching minister here at all, neither have had a long tyme albeit there are aboute foure hundred soules in our Towne and all the howses compact neere together, and noe other Church within a myle of us, and that a very small one twoe, and if the tide be up it is about twoe miles thither." This extract is interesting in that it provides information about the causeway crossing to Thorley, the present Thorley Road [B3401] across Thorley marshes. The text would suggest that this crossing was more of a raised causeway or 'hard' across the marshes that was covered by the sea at high tide but was uncovered at low tide and could then be used to cross to Thorley. These temporarily uncovered causeways are common enough in many places: Langstone, Mont St. Michel, Noirmoutier, Morton, Sandown/Yaverland. The parish church of Thorley is indeed one mile from Yarmouth across the causeway but, at high tide when it was covered, Yarmouth citizens had to reach Thorley church via Hill Place Lane. The Taylor and the Andrews maps both show the town windmill extant although by 1769 it looks as though it may have lost its sails and become a tower. Both show the salterns built on Thorley manor land lying where the causeway reaches Mill Copse. This salterns had gone out of use by 1793 when the present tide mill was built and possibly the salt pans were converted into the mill pond behind the embankment. Map by John Andrews 1769. Map in John Albin's A new, correct, and much-improved history of the Isle of Wight 1795. 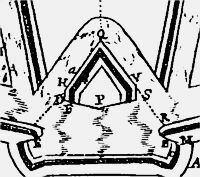 Admiralty chart by George Burns 1794, showing the "Redobt". Outwork Fortifications: the Lunette and the Half-moon. During the 16th century, the rapid improvements in artillery development caused a similar rapid and total transformation in the design, technology and philosophy of fortification. By the 17th century, the art of fortification had reached a state of maturity that was to remain substantially the same until the end of the 19th century. The development of the arrow-head bastion called into play a whole new range of factors for both defence and offence. Simply establishing a curtain wall with bastions at the angles [as at Carisbrooke] no longer sufficed and cities, towns and fortresses developed ever more complicated defensive lines around themselves. It was for the protection of the approaches to the main defensive bastioned line that engineers developed various types of small fortification, often dependent on the main line for covering fire but sufficiently forward to hinder an enemy's approach. Sometimes certain of these features were used independently on their own to provide defence for the mouth of a river or haven, a river crossing, a road or the entrance to a town. And so engineers developed ravelins, redans, redoubts, horn-works, crown-works, half-moons, lunettes etc. to cope with each demand. Over time certain of these terms were used interchangeably; often they were used very loosely and inaccurately to describe a fortification. Strictly speaking, each term describes a distinct type of fortification but often they were used very loosely and indiscriminately. Although termed loosely a 'redoubt' in leases (and indeed it was a redoubt in the later loose sense of that meaning) the fortification at Yarmouth answers the description of a "lunette". Originally known as a half-moon or demi-lune, the stricter term lunette emerged to describe a small fortification with two faces meeting at a salient angle and two flanks. 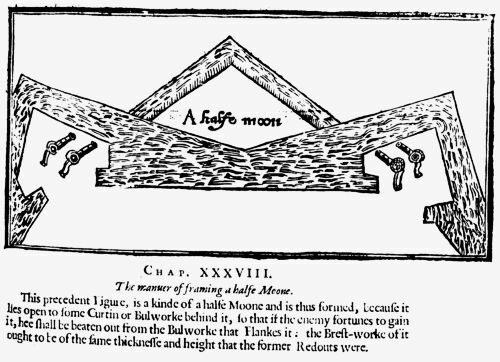 In the 16th and 17th century the term half-moon had covered two sorts of feature: one of which was very similar to a ravelin [except the half-moon increasingly possessed two very short flanks], the other synonymous with lunette [the term most probably derived from the fact that it was a smaller version of the demi-lune or half-moon]. Judging from the appearance of the word 'lunette' in various dictionaries of hard words and military treatises, it would seem it was developed in the late 17th century. 1. Anima'dversions of vvarre; or, A militarie magazine of the truest rules, and ablest instructions, for the managing of warre Composed, of the most refined discipline, and choice experiments that these late Netherlandish, and Swedish warres have produced. With divers new inventions, both of fortifications and stratagems. by Robert Ward. 1639. 2. 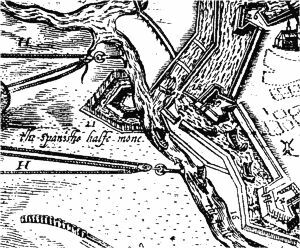 These two images show a half-moon, The Spanish Half-moon, as part of the defences of Ostend in Belgium during the siege of 1601-1604. Belägerung der Statt Ostende. Journal. 1604. A true historie of the memorable siege of Ostend and what passed on either side, from the beginning of the siege, vnto the yeelding vp of the towne. by Edward Grimeston. 1604. 3. The First Lecture being an Introduction to the Military Architecture, or Fortifications. Sir Balthazar Gerbier. 1650. That Half-Moons are small Works advanced towards the Fields, and are usually placed before the points of the Bastions for their re-inforcement, having small Flanks. 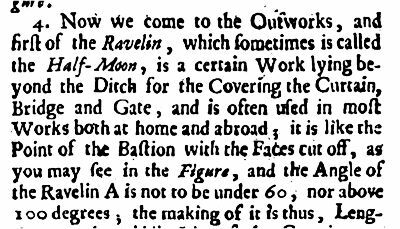 That a Ravelin is a peece of Fortification consisting onely of two Faces, usually placed in the Mote, before the Curtains, and Gates. 4. Modern fortification, or, Elements of military architecture practised and designed by the latest and most experienced ingeneers of this last age, Italian, French, Dutch, and English, and the manner of defending and besieging forts and places ... by Sir Jonas Moore 1673. 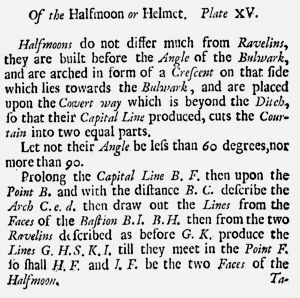 However, by the second half of the 17th century, the use of the half-moon was falling out of favour with engineers. 5. Fortification and military discipline in two parts : the first shews the principles and practice of all manner of fortifications, regular or irregular, as now used by the Dutch, English, Italian, German, and French ingeniers : the dimensions and measures of the rampires, parapets, moats, and all other parts : the delineations of ravelins, halfmoons, tenails, hornworks, crownworks, and cittadels ... by Capt. J.S. 1688. 6. The new method of fortification. Sébastien Vauban. 1691. 1. 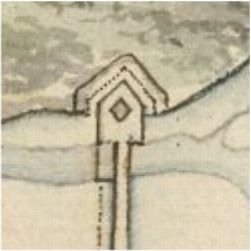 In Fortification, a small Work generally rais'd before the Courtin in Ditches full of Water: It consists of two Faces making a Re-entring Angle, and serves to dispute the Passage of the Ditch. 2. LUNETTE a small half-moon. 3. A Lunette has two faces, similar to the redan, and also two flanks. 4. A work larger than a redan, consisting of two faces, and two flanks. 1.Demi-Lune, Half-Moon, in fortification, an outwork..consisting of two faces, and two little flanks. 2. Fortif. An outwork resembling a bastion with a crescent-shaped gorge, constructed to protect a bastion or curtain.